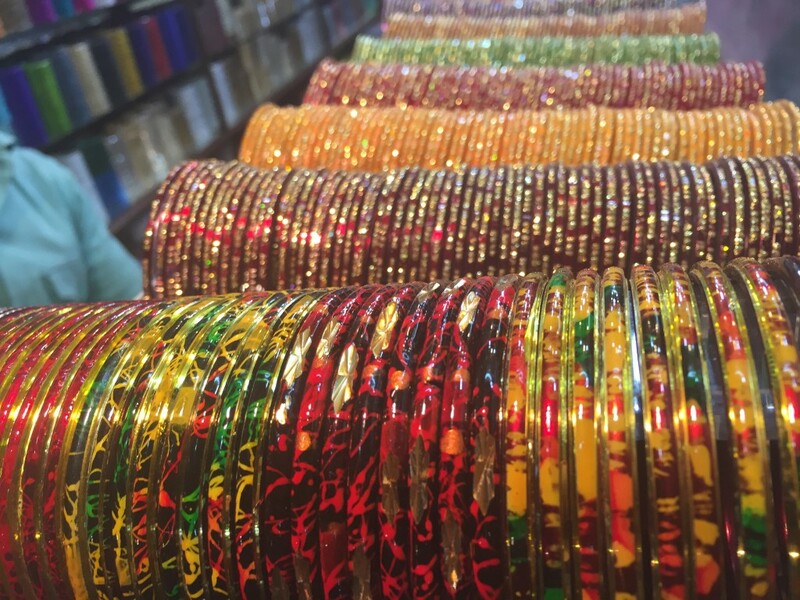 Home » Travel Tales » Banaras: Bold, Beautiful and Bejeweled! 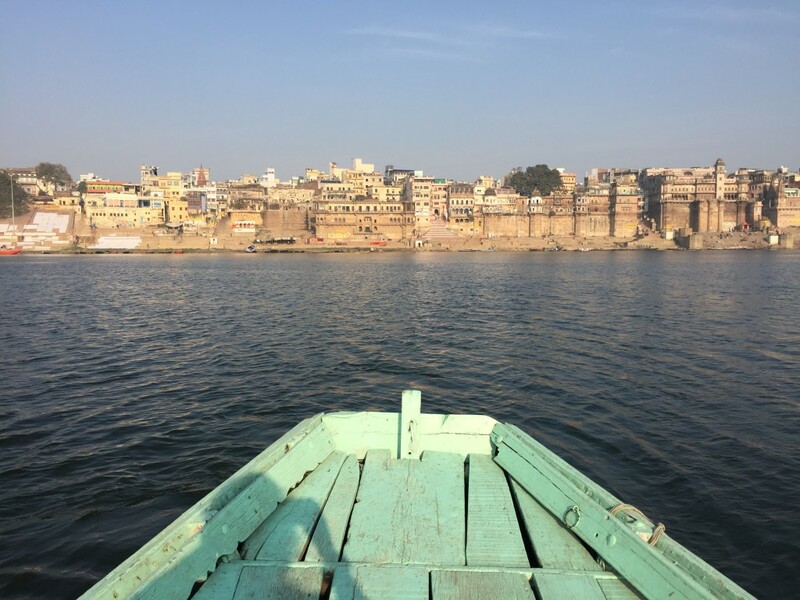 “Banaras is older than history, older than tradition, older than even legend, and looks twice as old as all of them put together”- Mark Twain..
“Kashi” as locals calls it, is a city that should be savored slowly- almost like the ‘paan’ that comes associated with this name in its prefix. It is a city that you either like for its character or dislike for its dirt. So, while packing your suitcase, pack patience. Because, if you don’t wear that, it will be hard for you move along or experience it. 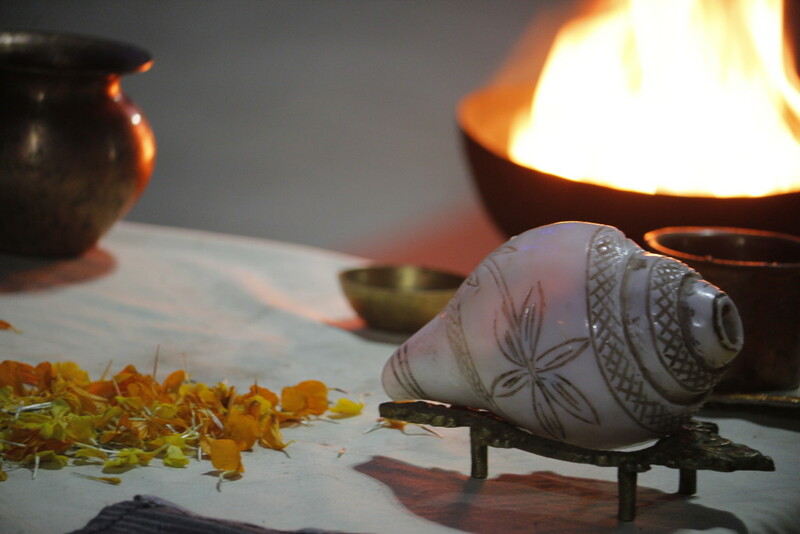 Be it, for allowing the musky smell of camphor to entice you, the sounds of hyms and chants to invigorate you, or even the ability to maneuver through the fresh cow-spills on the road! 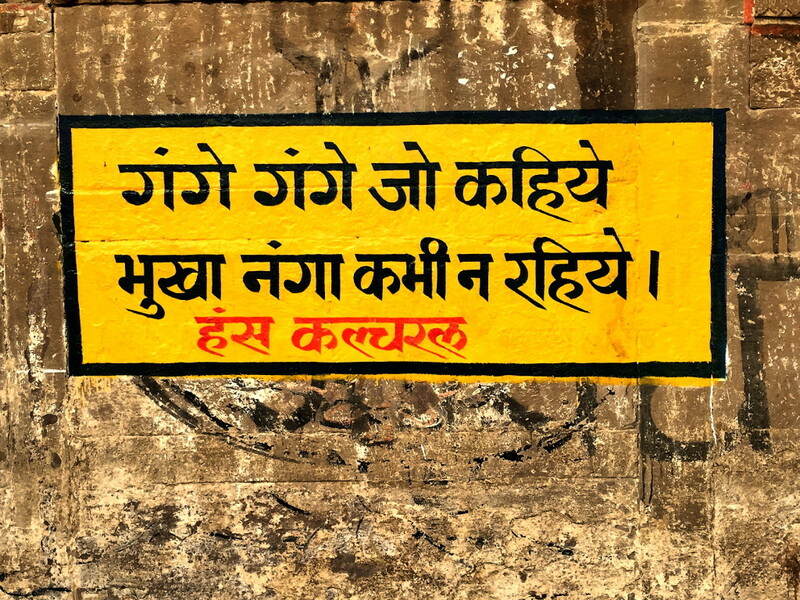 But once you give a margin to the filth and traffic, you will start liking the place. There is astonishing energy. There is a vibrant spirit among the people who call themselves as “Banarasis” whether they are rickshaw pullers, merchants or rich. 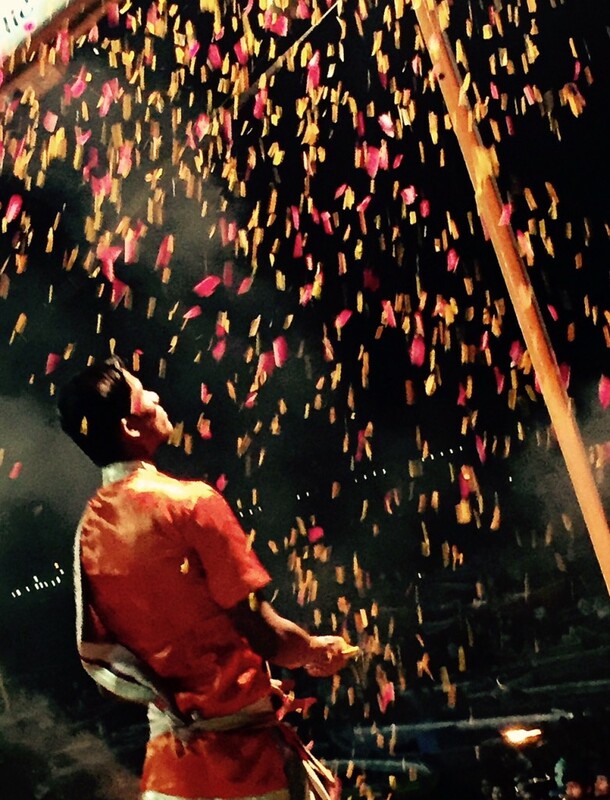 There is an art of living, both passionate and carefree- “masti”, “mauj” or “phakkarpan”. There is an enjoyment of life without ostentation. 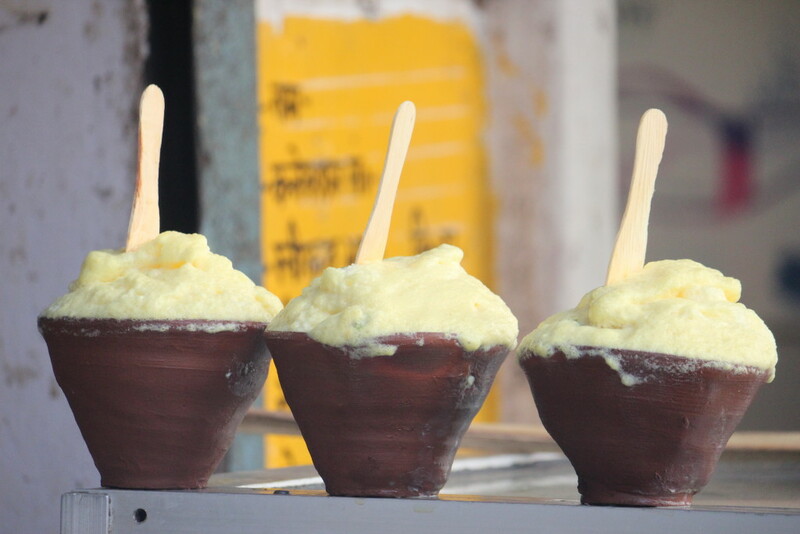 If you had forgotten your simple childhood of mango trees and licking fingers with ‘churan‘, it re-teaches you that life is indeed about the simple pleasures– a bath in Ganges, simple ‘poori-subzi’ for breakfast, a mouth full of paan (betel nuts and other condiments wrapped in the tenderest and most succulent green leaves), a nap under a tree shade, a tall frothy glass of thandai with a dose of bhang – and you will say your day was fulfilling! 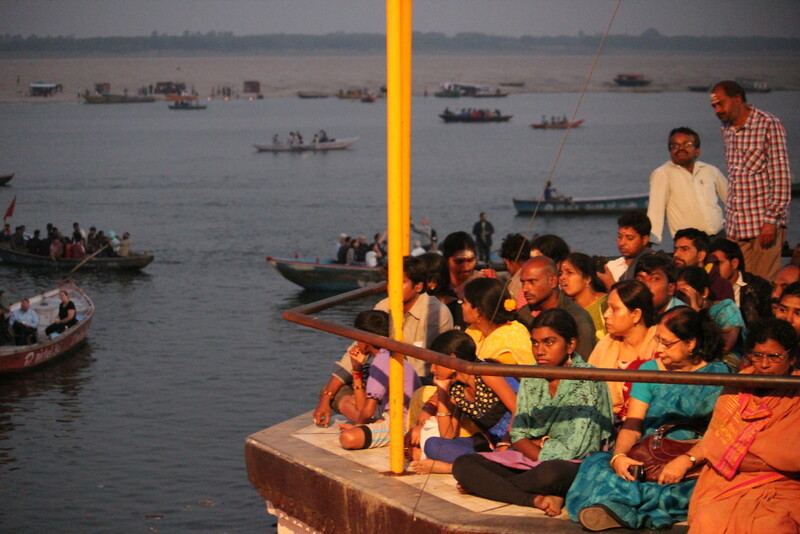 The beauty about Varanasi is that one is never a mere spectator. You are always a part of the frame. Nightlife exists but in a different form – and the soundscape is nothing short of intoxicating! 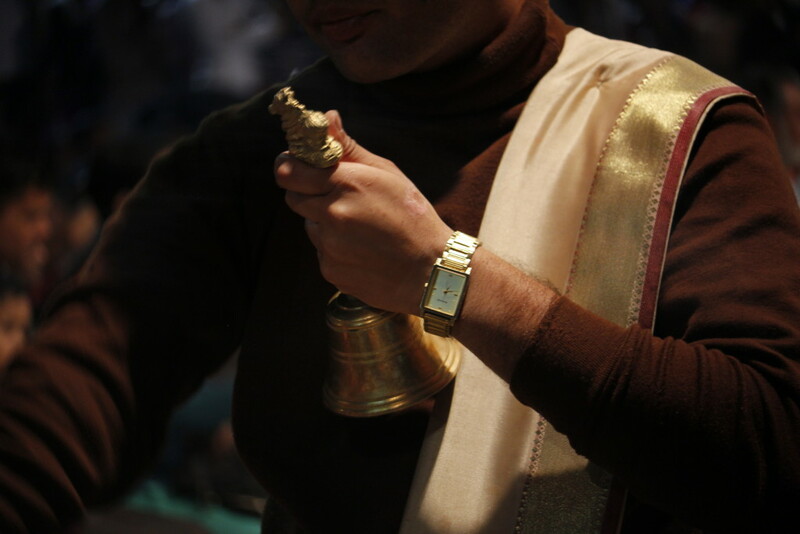 The clang of temple bells ,chants, hyms, often interspersed with the ‘azaan‘ or some Bollywood music. 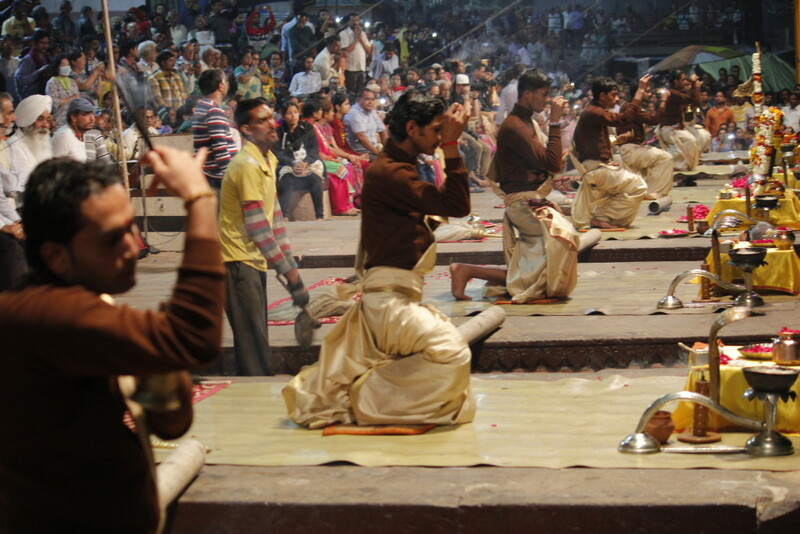 It is an ambience of urbanity, good living and culture all which comes to be synonymous with the word “Banarasi“. 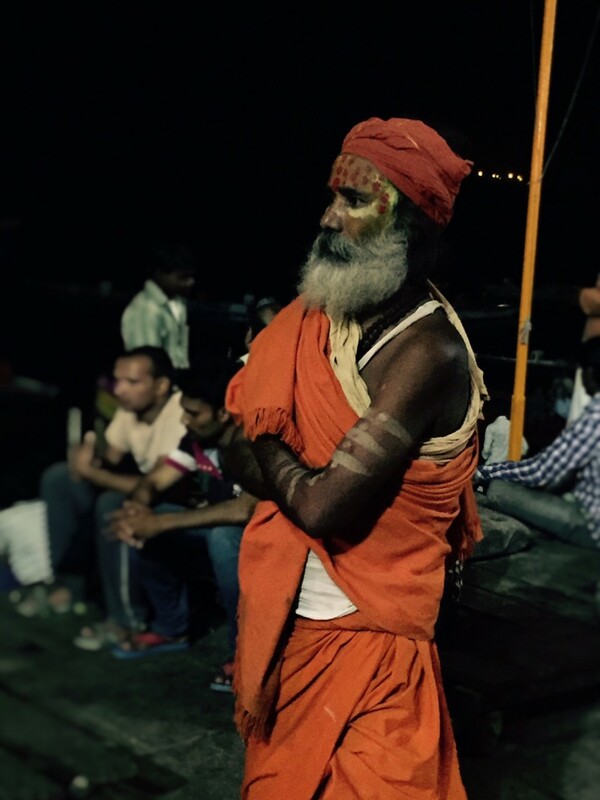 Banaras is a place where living and dying are celebrated. 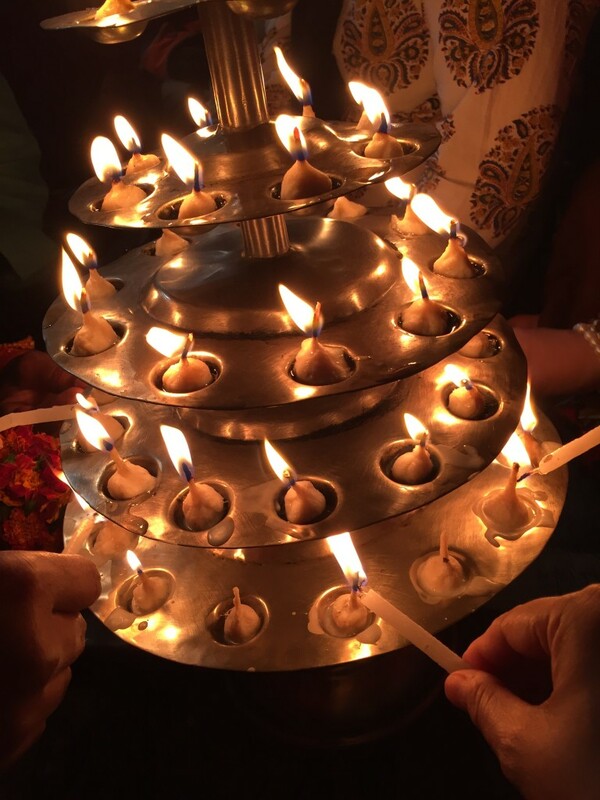 A city where death is a celebration, where the netherworld, heavens and earth all meet.. symbolically perhaps representing the three spokes of the trident Shiva, the host god of this city, holds in his hands. When I was a child I had (and still have) a deep attraction towards the tiny stories that sprung up from the larger mythological tales. This is a city that comes closest to bringing those stories to life. It is said that all great cities of the world lie next to a river, but never has a river changed its course to touch the banks of a city! 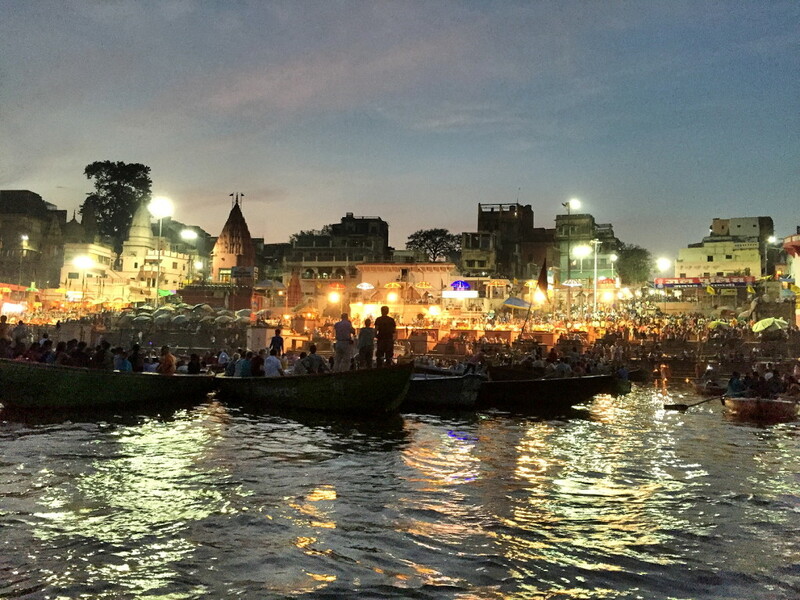 It is perhaps the holiness of Banaras that makes the Ganga , till now flowing eastwards, suddenly veer north, as if reminded of her origin in the mountains where Shiva lived. 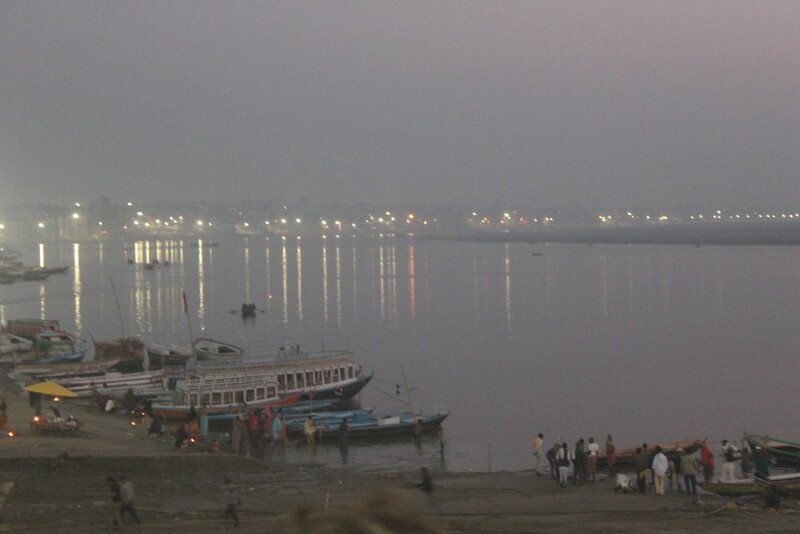 Uttarvahini (northbound), is what the Ganga becomes, in Banaras. Life in this city flows along this one eternal river. A river as truthful as truth herself, and as ancient as history itself. 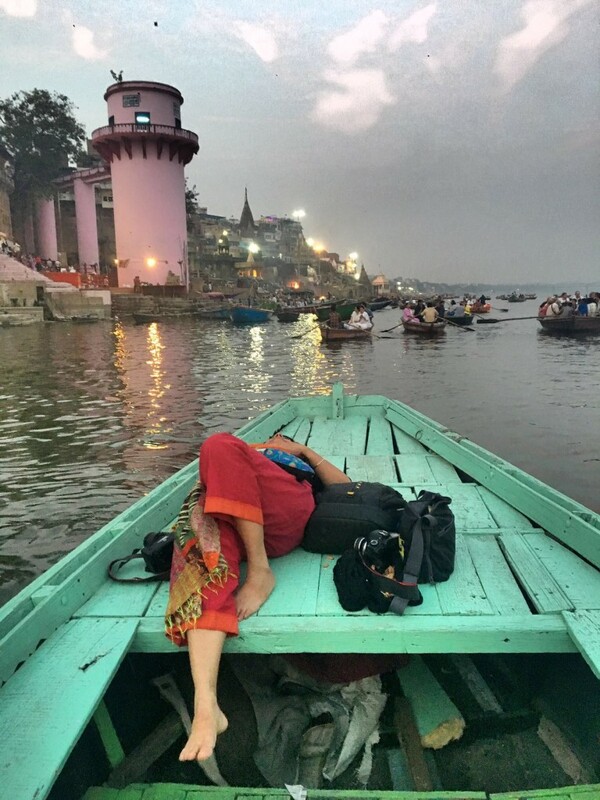 At each sunrise,while we sailed past the ghats in our boat on the Ganga, and watched the steps that led up from the water to the shore, come to life, I would immerse myself in letting the stories that I had once listened come to life, peeling oranges on my bed in the winter sun, while Dida spun her yarn. Like the story of how Lord Shiva saved the demon-king Sukeshi, from the fire stings of the angry Surya(Sun god), by staring so hard at him that the sun god himself hid in a cool talk, trembling in fear. That pond is the Lolarka Kund, in between the Assi Ghat and Tulsi Ghat. In my mind, a dark-blue silk robed Sukeshi, falling along with his aerial city between heaven and earth, folding his hands for mercy, and praying to his Lord Shiva, while his hair flies like the tributaries of the river..a picture so vivid! 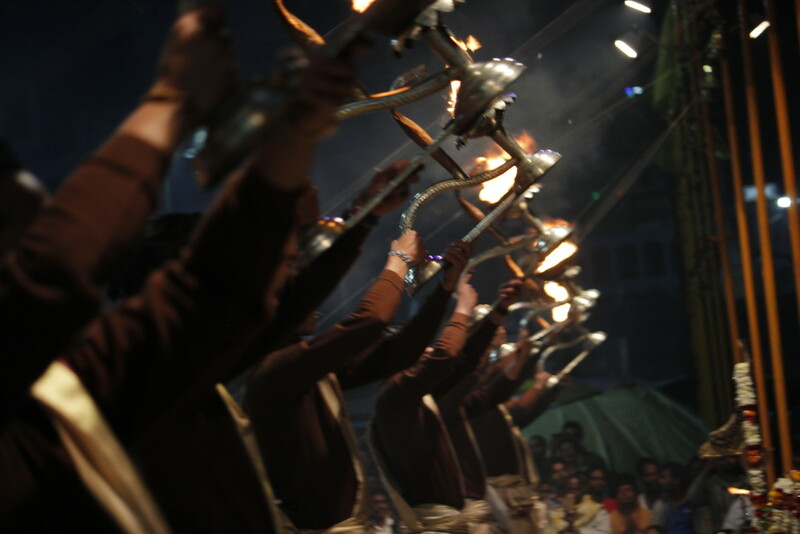 Assi Ghat hosts the recently introduced program called Subah-e-Benaras, a cultural programs, mostly for tourists comprising of an arati, school children singing hymns and chants, followed by a yoga ritual for everyone. Very touristy, but nonetheless beautiful. 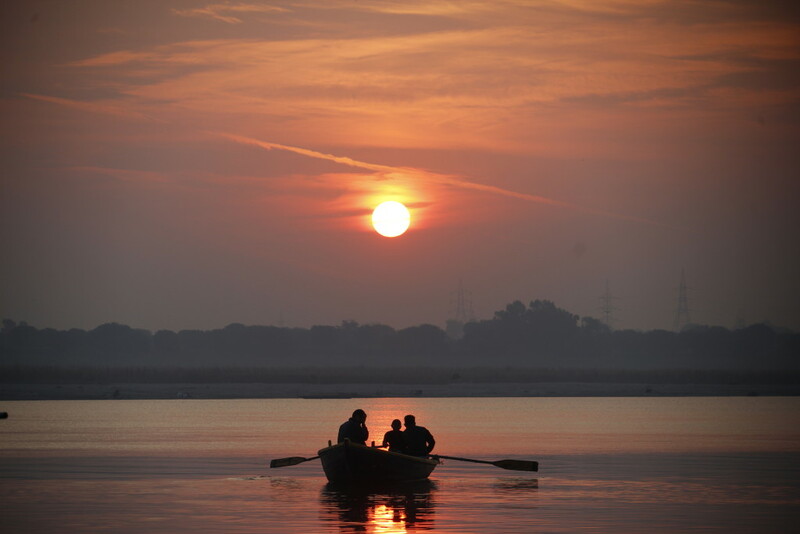 Or the story of Nishadraj Guha, who was the king of Kevati, a small fishing hamlet on the banks of the Ganga. In the Ramayana, when Rama was sentenced to exile along with his wife Sita, and the doting Lakshmana it was here, near this hamlet, that he was dropped by the royal charioteer. 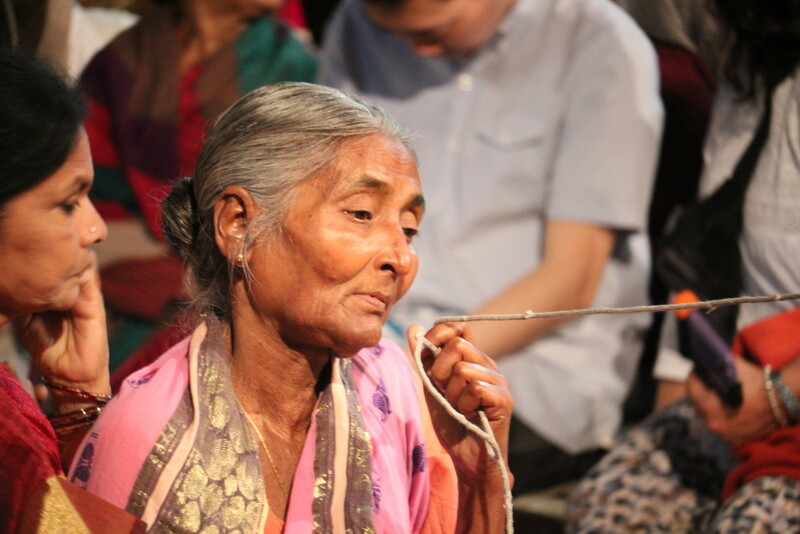 Here he tied his hair into the hermit’s knot. They were to start their journey into the forest the next morning. 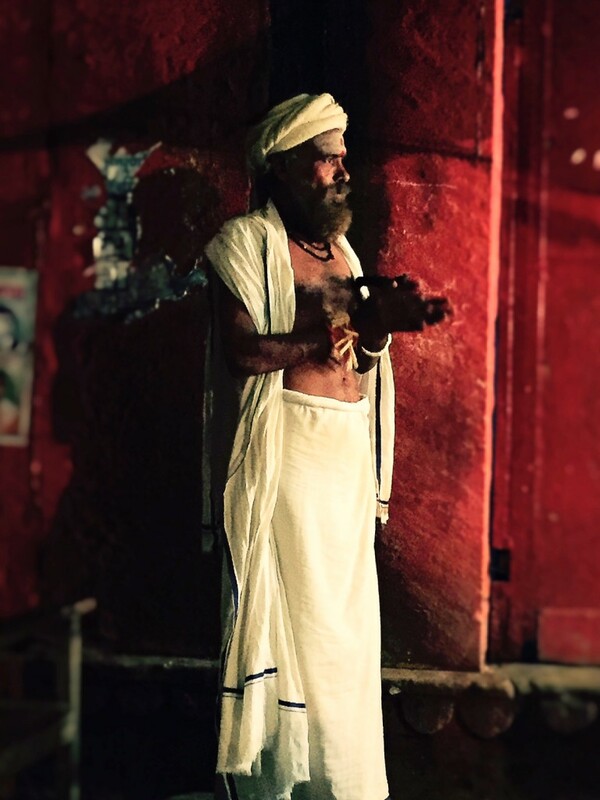 While they slept that night Guha kept vigil and offered them fruits, berries and roots from the forest that would make them stronger for the tough journey ahead. Rama never forgot this act of kindness and this gesture of true friendship. Later when he returned from his exile, Nishad became his coveted friend and was even invited for his coronation ceremony. 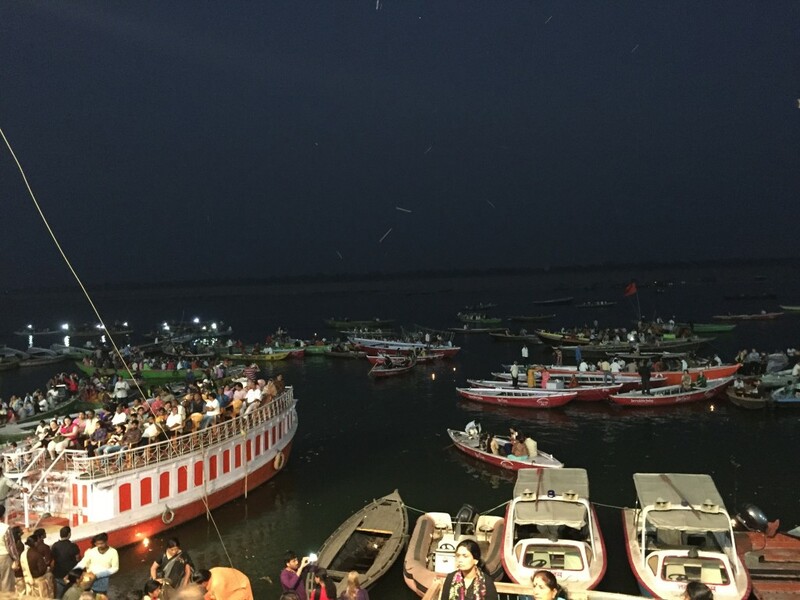 In honour of this mythical hero of fishermen, the Nishadraj ghat– a congregation point for fishermen and their boats, was built to honour him along with the Nishadraj temple. 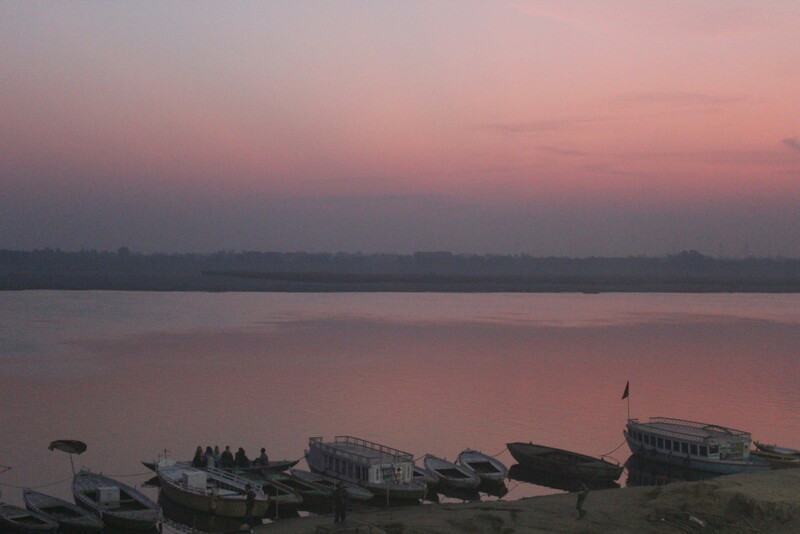 Fishermen and boatmen consider this ghat a pilgrimage of sorts, so testified Hanuman, our boatman! 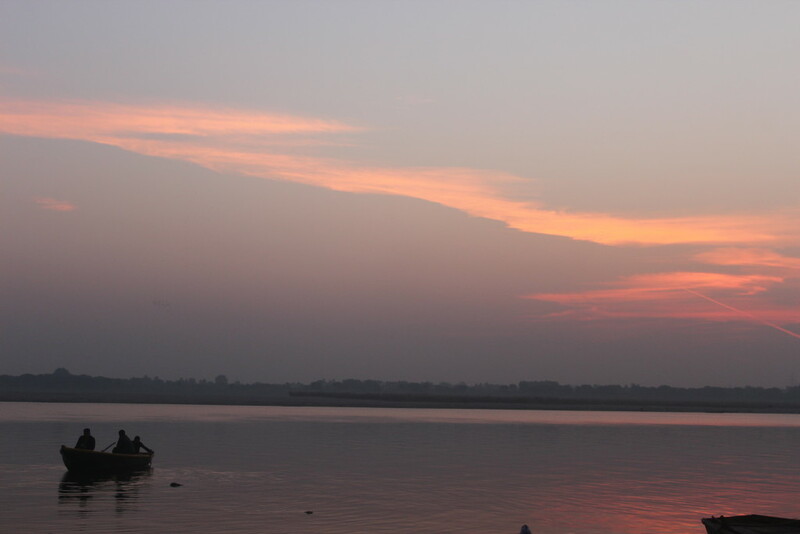 A few oars down was Chet Singh ghat which is a fortified ghat with a historical background. The site had witnessed a fierce battle between the British troops of Warren Hastings and former Maharaja of Banaras Chet Singh in 1781. It now boasts of an impressive façade with turrets flanking a giant gateway. 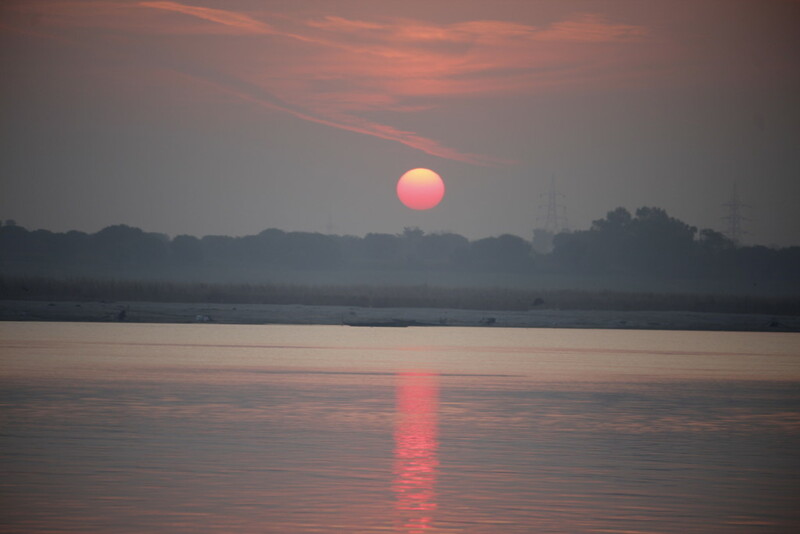 Not to mention, it is an impressive component of a backdrop for photographing the Ganga skyline! 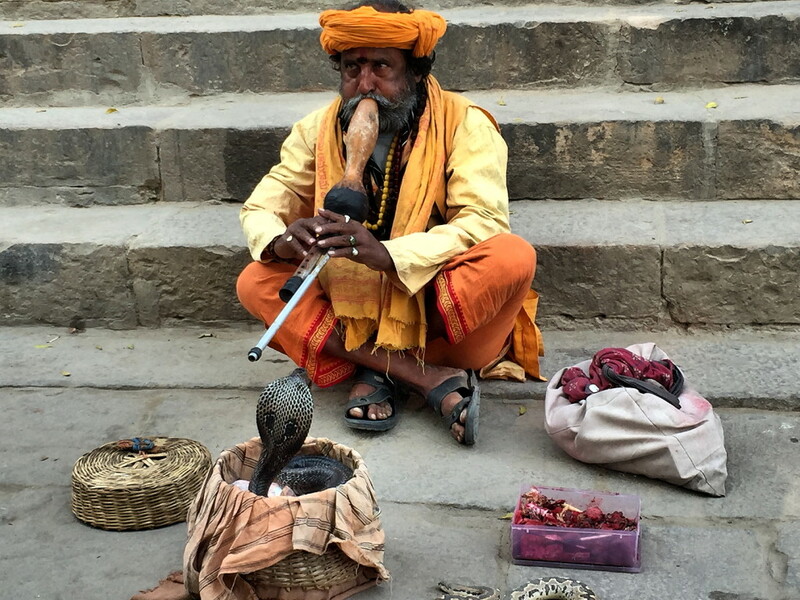 Every ghat has a story- either mythological, religious or historical. Harishchandra was a king of the Suryavanshi (the Solar dynasty), famous for his piety and scrupulous adherence to justice that he wouldn’t cremate even his dead son without a fee. 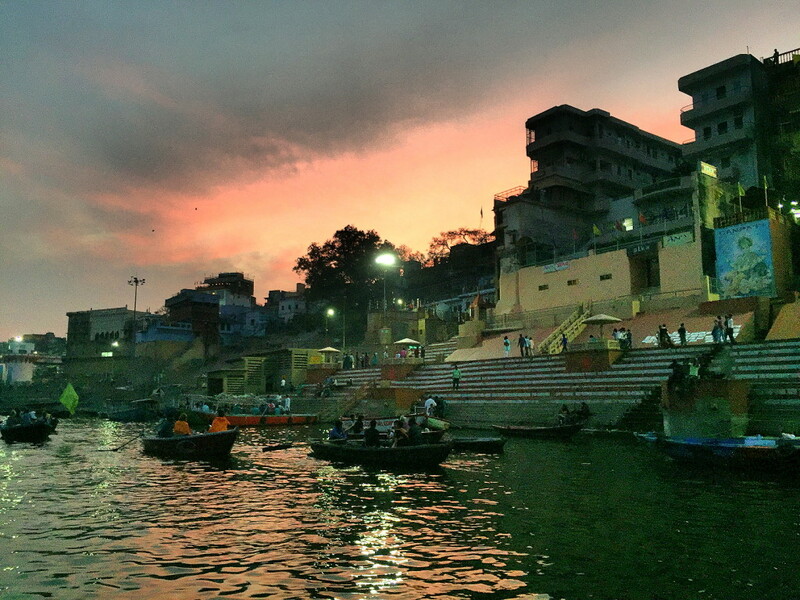 Named after him, this ghat is one of the two cremation grounds in Banaras. Rana Mahal ghat, Darbhanga ghat– both have magnificent palaces- The Rana Mahal has beautiful Rajasthani turrets and filigree of stonework in its balconies, and the Darbhanga made of sandstone has grand porches and Greek pillars. 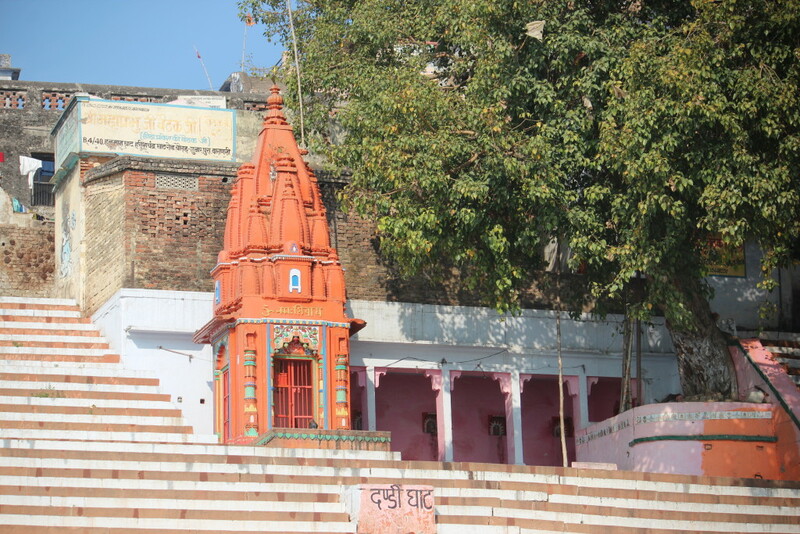 At the Manikarna ghat lies a dramatic temple, half sunk into the river. Legend has it, that a nobleman decided that he would build a temple to repay the debt that he owed to his mother for giving birth to him and for bringing him up. But the temple tilted and half sunk into the river- since no son (or daughter, for that matter) can ever repay his mother’s debts. Panch Ganga ghat is superbly imposing with the tall minarets of the Dharahara mosque built by Aurangzeb and the cluster of shorter temples around it. Gowdolia crossing is quite simply the most chaotic spot in Banaras! Rickshaws, scooters, cycles, motorbikes, auto-rickshaws, determined locals, confused Indian pilgrims and backpacking tourists on foot mingle and dart in different directions. If you stood at the center at looked at any direction, it would seem like two shoals of fish flowing in opposite directions. Magically, each vehicle is keenly aware of its neighbor, and reacts to it. Side view mirrors of two wheelers are turned in at all times. Amidst all this, loudspeakers, alternately broadcasting religious songs and political speeches add to the din. From here you can choose any galli, that you want to explore. 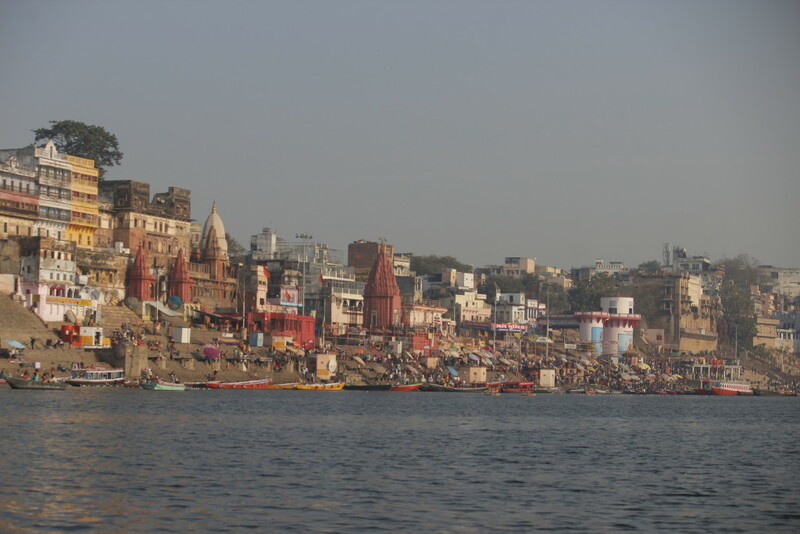 The total length of Banaras’s gallis is said to be 480 kms! Narrow labyrinth lanes barely wide enough for two people of ample girth to pass through! 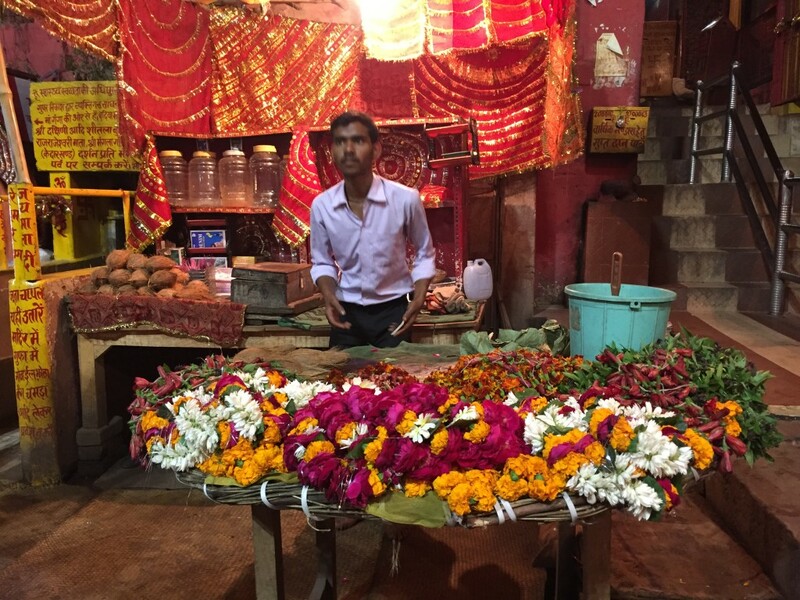 These are the city’s nervous system, and have buildings, often three stories high with narrow doors, steep steps and ornate verandahs on the top, with crammed bustling shops on the ground floor selling bangles, fabric, sweets, souvenirs, charms, posters of Hindu gods and miniature statues of them. 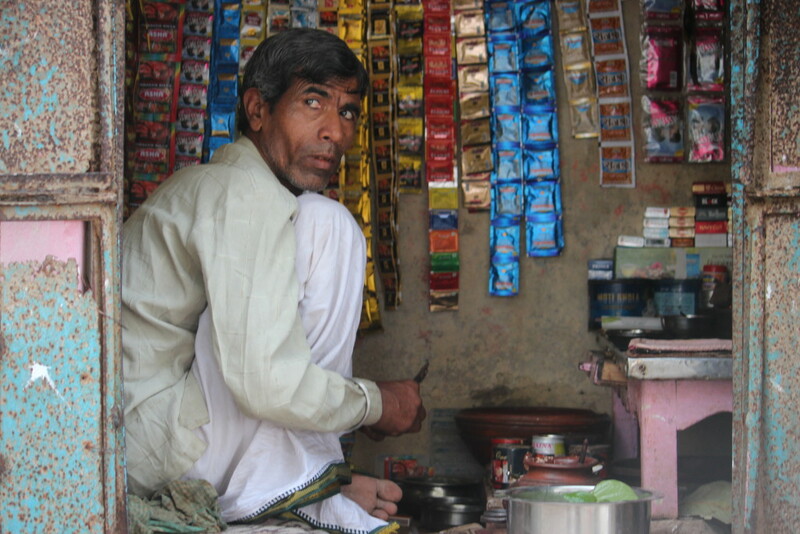 Most names of gallis are synonymous with what they sell through it. 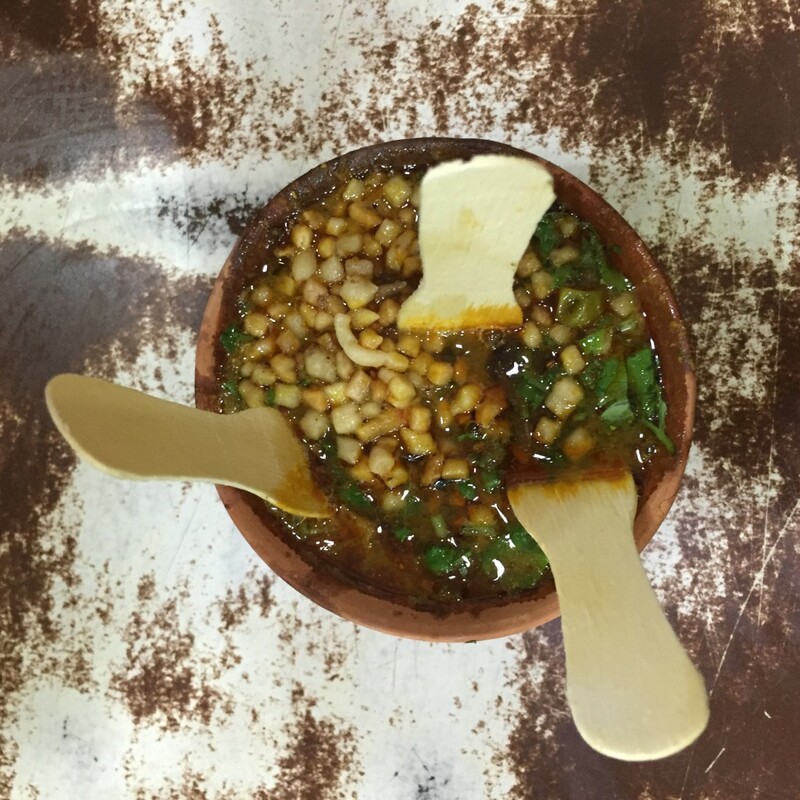 So there is Kachori galli, Khoya galli,Kunj galli, Paan dariba, etc. 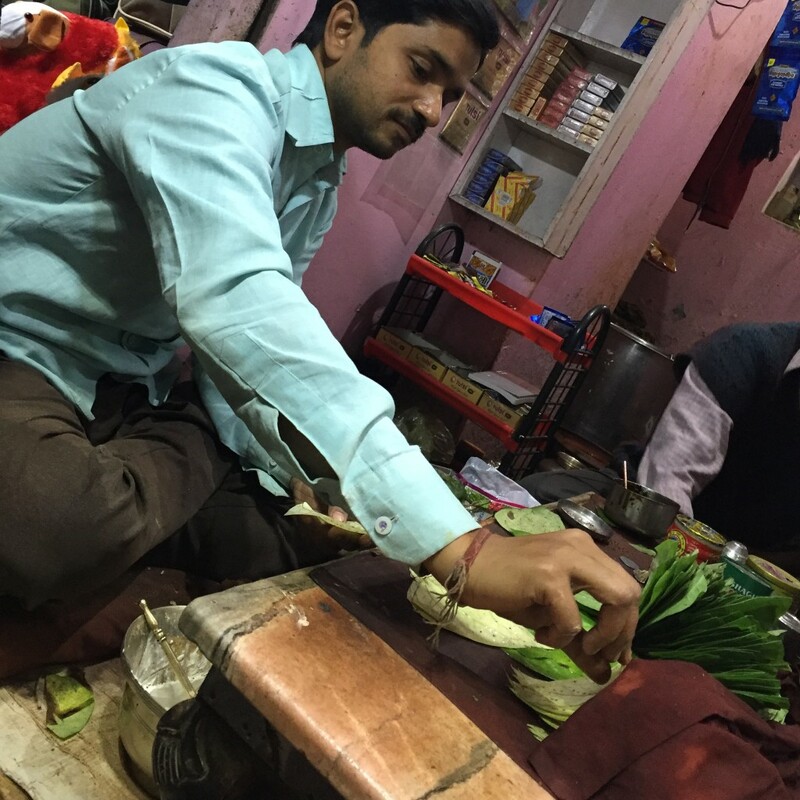 In one such (much hyped and famous), called Vishwanath galli– a galli leading to the Kashi Vishwanath temple, sits Dasgupta, with his 180 year old business of pan masalas and ittar! Generous trials of every kind led me to buy a half dozen varieties from him. 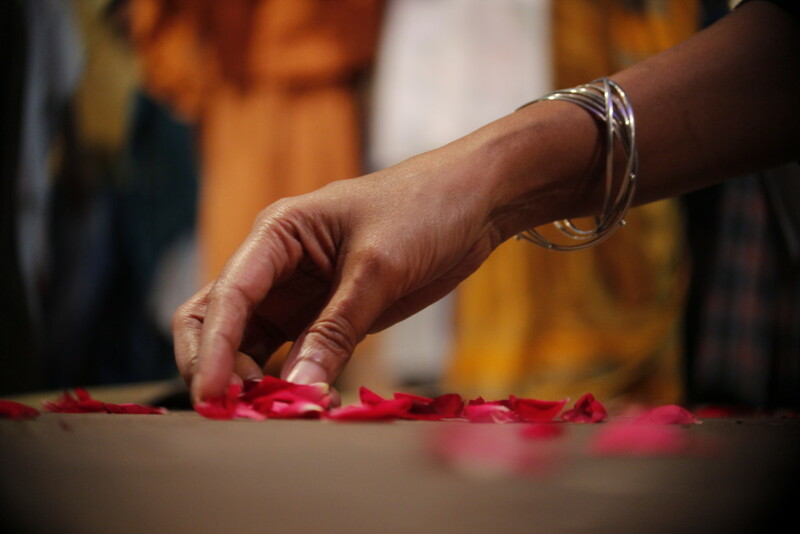 Kasturi ittar for Dida, and jasmine for my mother. And, apart from his products being paid in cash, he found his long lost soul friend in our own Balaji.. smearing him with oodles of affection, a strong scented ittar which he promised wont go away before a week! 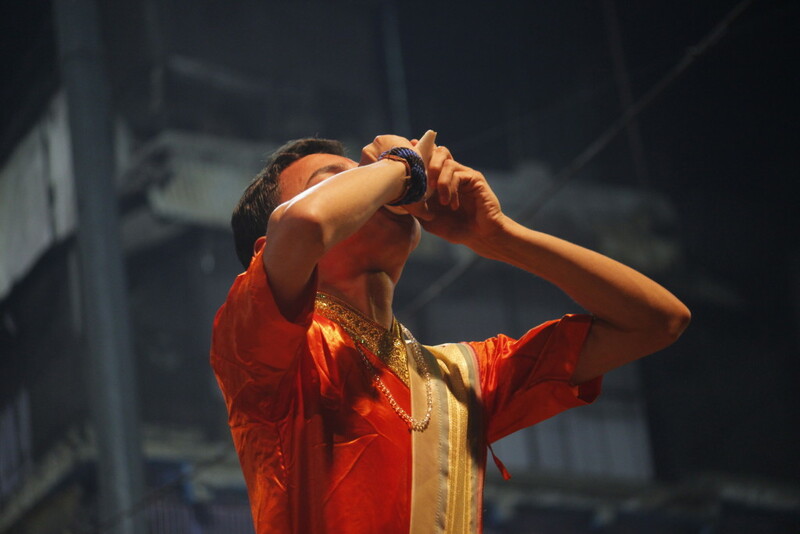 We quickly had to take Balaji to have more helpings of the malai lassi, so that he could forget this ‘act’ as quick as possible! 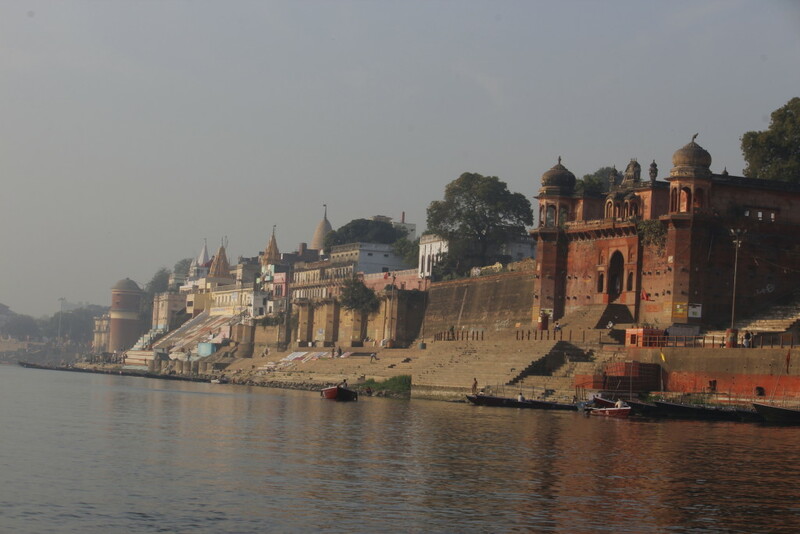 Banaras is a land of temples. 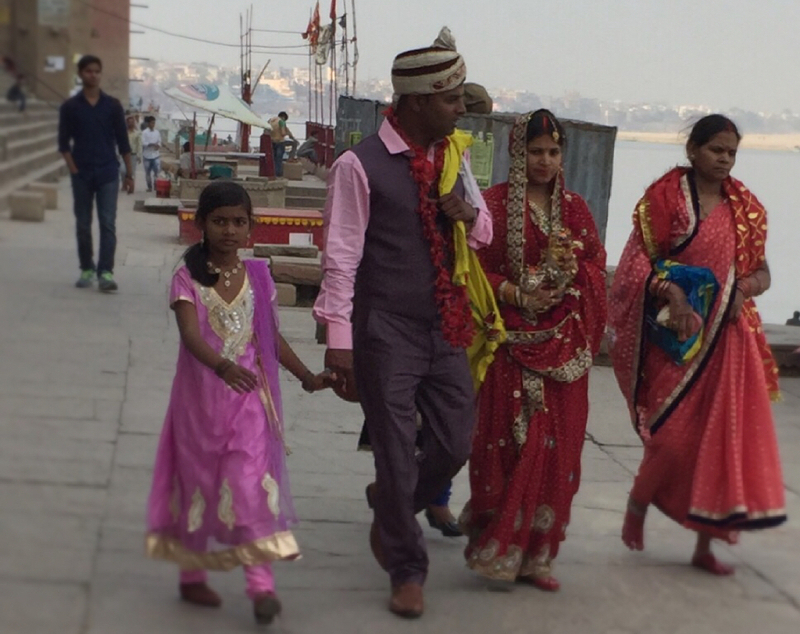 In a country where today political preferences outsize religion in so many instances, it is simply amazing how in the most ancient site of salvation for Hinduism, stands the oldest Hindu temple in the world, sharing a common wall with a masjid. 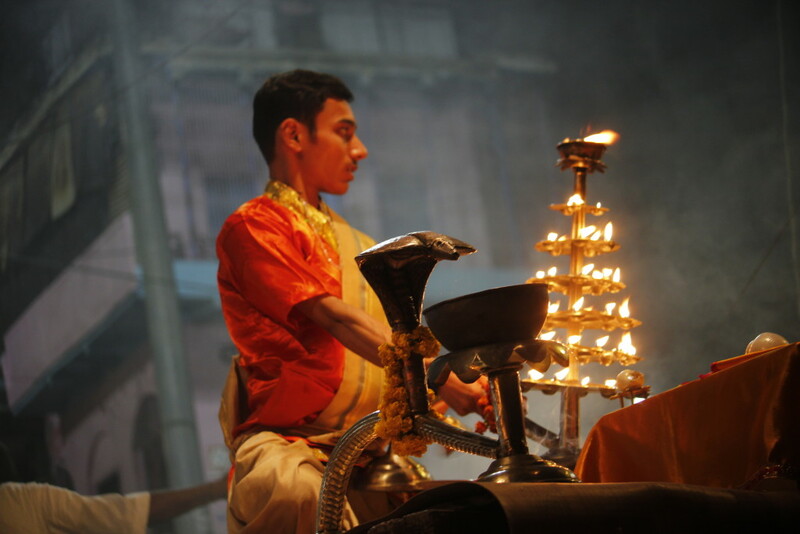 The beating heart of Varanasi, Vishwanath Temple is dedicated to Lord Shiva and is the holiest of the 12 revered jyotirlingas in the country. 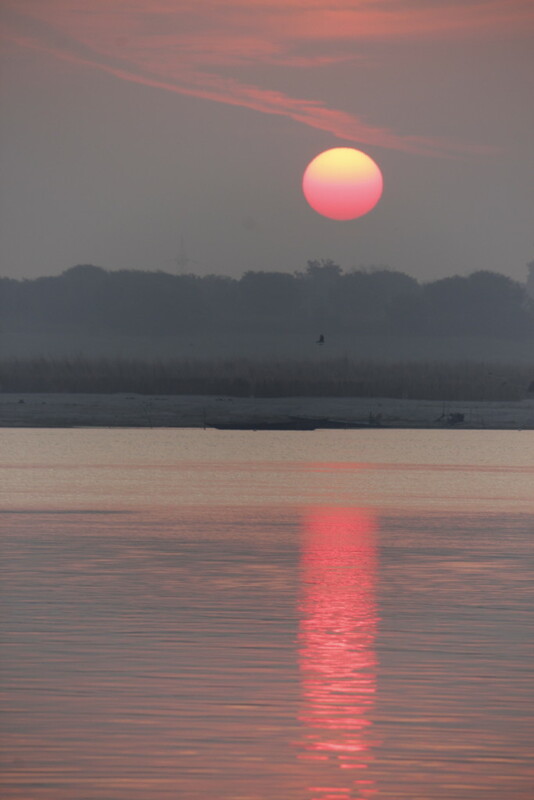 So much is the austerity, that even its glimpse is said to be auspicious. 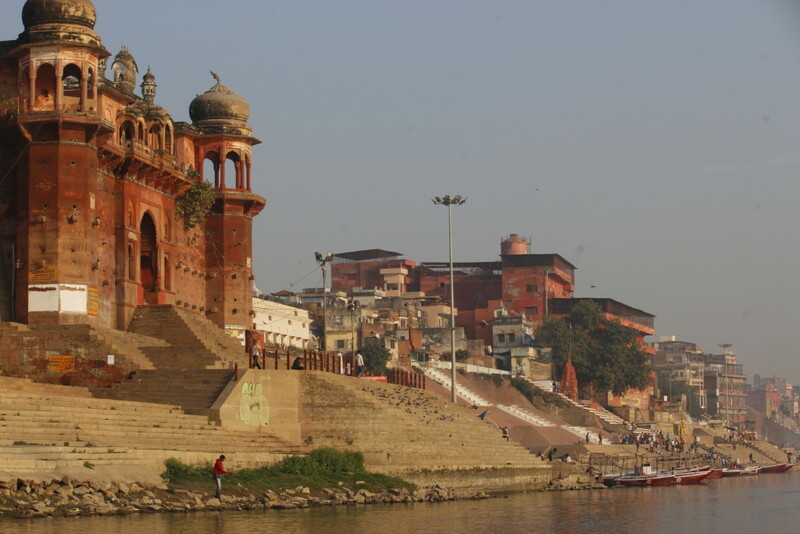 The mosque alongside is known as the Jnana Vapi(well of wisdom), named after a well of the same name. 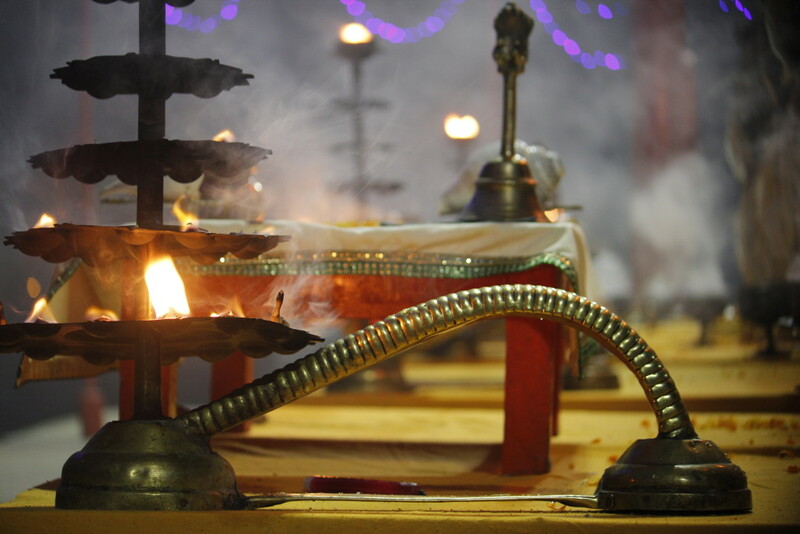 It is believed that the Jyotirlinga was hidden in this well to protect it at the time of an invasion and the main priest jumped in the well with the Shivalinga in order to protect it. Some say visiting this temple is written in your destiny. 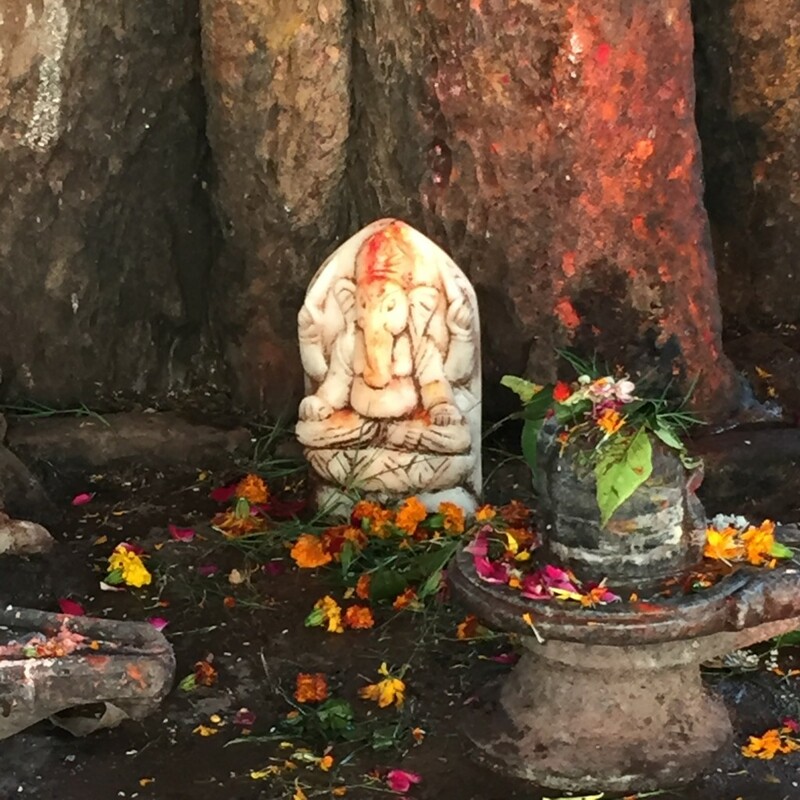 Setting step on this ancient site, whispering your wish-list into the ears of Nandi, who is Shiva’s vahaan (and often the conveyor of wishes of devotees, should he/she be unable to reach the ascetic God, who is perpetually meditating), does run a chill down your spine. In spite of the rush and hurriedness of the visit, the darshan will remain as of my most coveted ones. 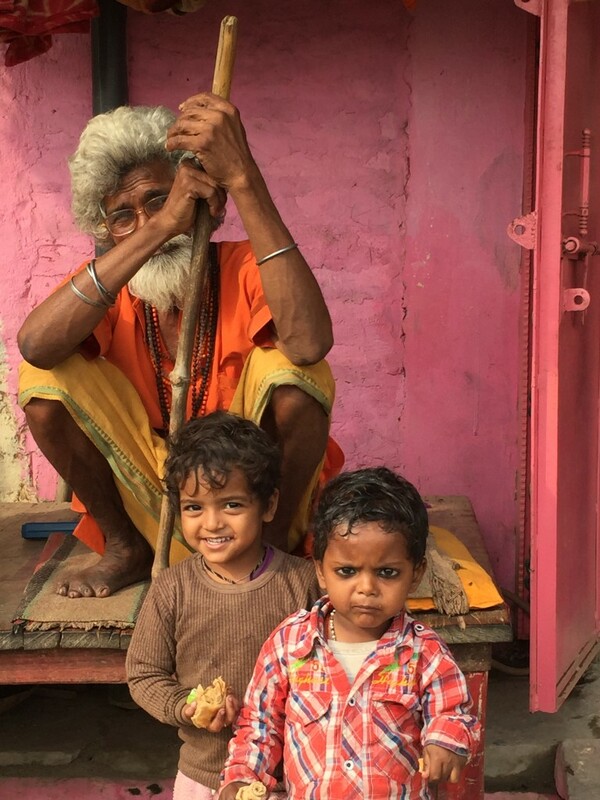 Our little trip to Banaras helped some of us make new friends. Paradoxically in one of the oldest cities in the world. We together did a lot of things.. plunged into the Ganga off a boat, devoured the delicious tamatar chaat, licked off malaiyo and kesari doodh from earthen cups, sipped kullad chai by the hour starting from sunrise, buy dozens of pretty bangles, haggle over Banarasi sarees, buy ‘prasad‘ at the sarkari bhang ki dukaan, pose for photographs… and finish our meals with the most delicious Banarasi paan! Long before Dhanush made my heart flutter on the sets of ‘Ranjhaanaa’, a movie shot in this city, and long before Deepa Mehta’s ‘Water’ was stoned with controversy, there was an essential urge in me to visit this city; with ghats that are both dreamy and dramatic, poignant and filled with life, majestic, yet timid in front of the might river that has the power to wash away sins. 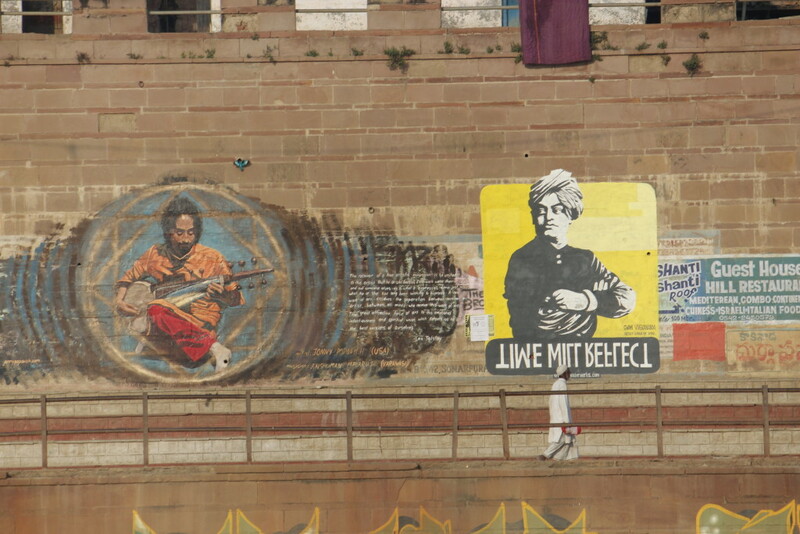 The essential character of the city is in its bonhomie of colours and the bohemian spirit of its people. There is a feeling of the millennia, of the past, and of the traditions which the city carries in its personality. 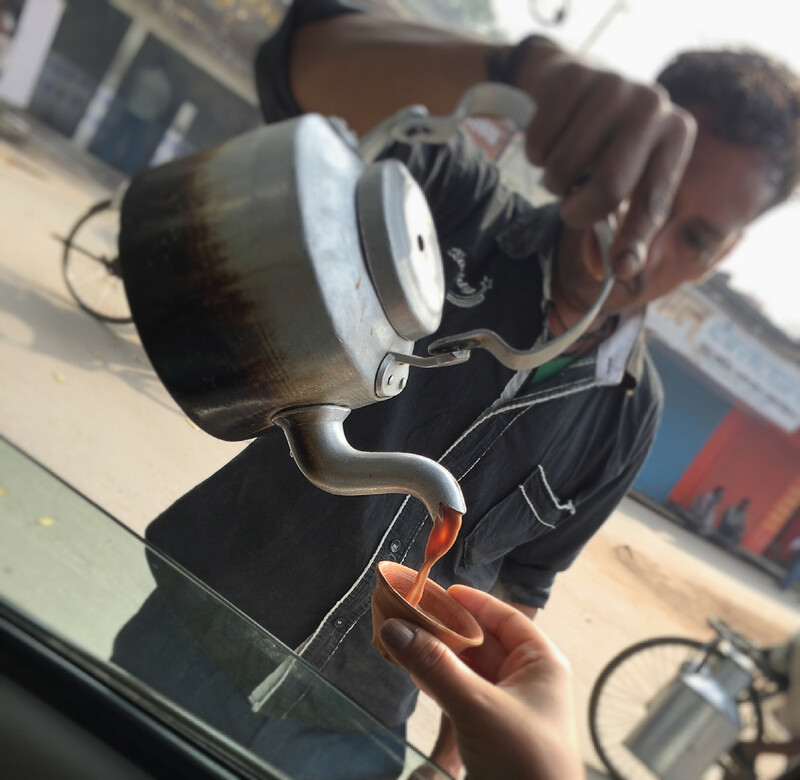 Banaras, be still, hold yourself in this dizzying time warp ! Sambrita, that was a fitting tribute to this mesmerising city. I am glad and so happy that you call this a ‘tribute, Rinku di… It is indeed mesmerizing, and often there was a thin line between the city doing that to me, and transporting me to an realm of enchantment. It is clichéd…but it is so befitting, that I couldn’t resist. 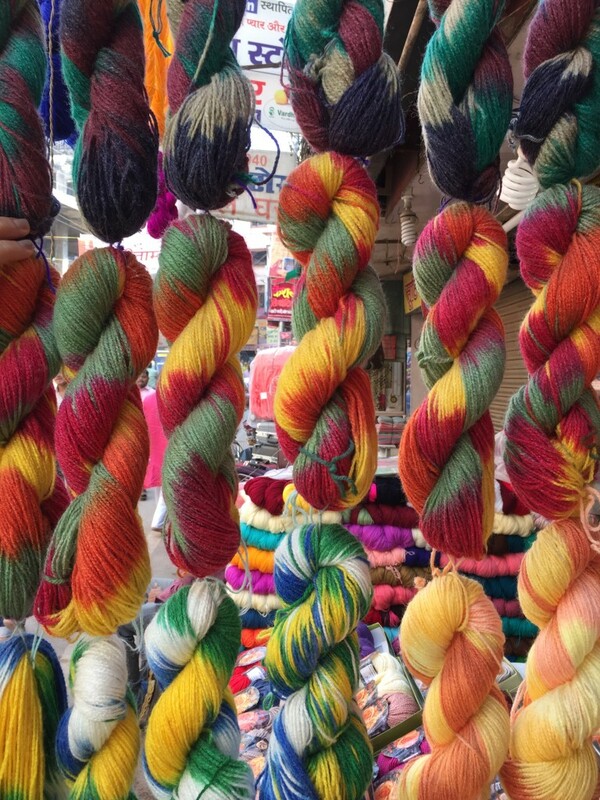 Amazing article and photographs are visual feats . Look forward to reading your next travel article. Tun.. thanks! 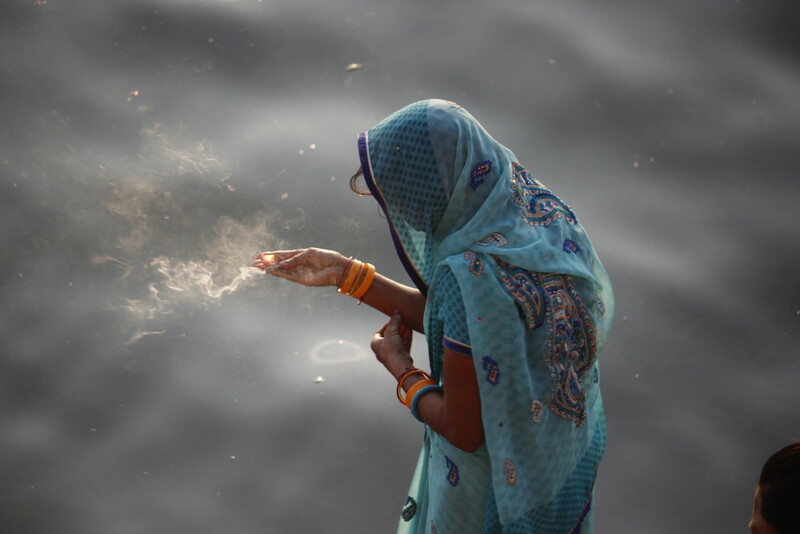 The ‘plunging into Ganga’ are censored pictures! But yes, this isn’t a ‘complete’ trip. The magnetism of the place is calling me back.. and very soon I must visit again. anyone would fall in love with the city. I am proud of your writing. 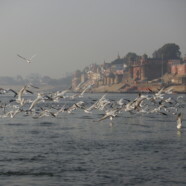 Frankly speaking.I should stop reading anything more about Banaras! The reason is every place ,especially a city which is extensively travelled and written about, the prose starts losing its charm to me somehow because its repetition at some point. 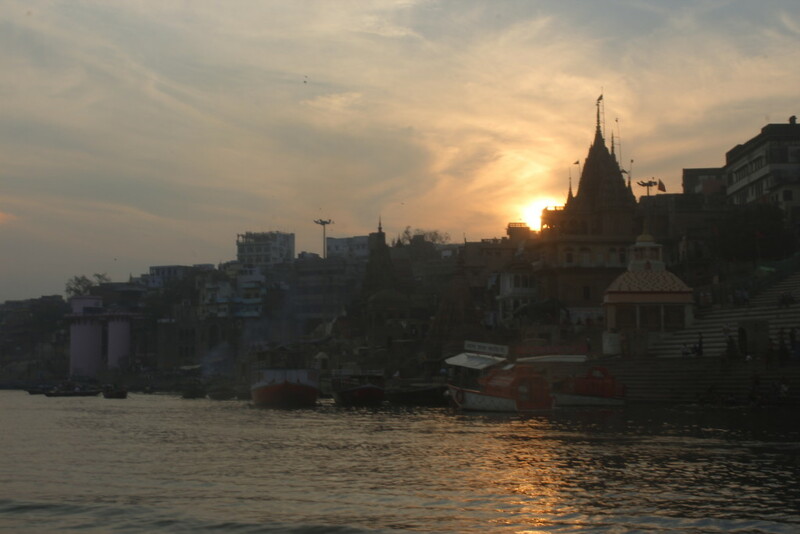 (From a long time I have been reading about Benaras and more so from the day you (Sambrita) magically proposed me the trip!) I shouldn’t have …reading over an over again about something ,for me, does diminish its qualitative value. BUT for this weirdness I am completely to be blamed. It has nothing to do with your narration of the magnificient city and your experiences. At some points I totally relived them. Thank you Sambrita for gifting me the proposal of this trip. I shall not forget this in a hurry. As someone who has to sell her writing to create an impact, there is one thing I always follow. An impactful piece of writing should either have you at the first line with a small moment of wonder, or a shock value! You can choose, what I make of your first line.. I am in love with it! The manner of soaking in a place that one visits can be either of the two- follow the herd, and soak in whatever comes your way. Or follow the herd, still, but have your own marvelous moments that remain chaste only to your own fervour . I am glad, that although we were more often together, than alone, both of us did create our own chaste moments. I am glad I was a success at making you relive some of these (common) moments. 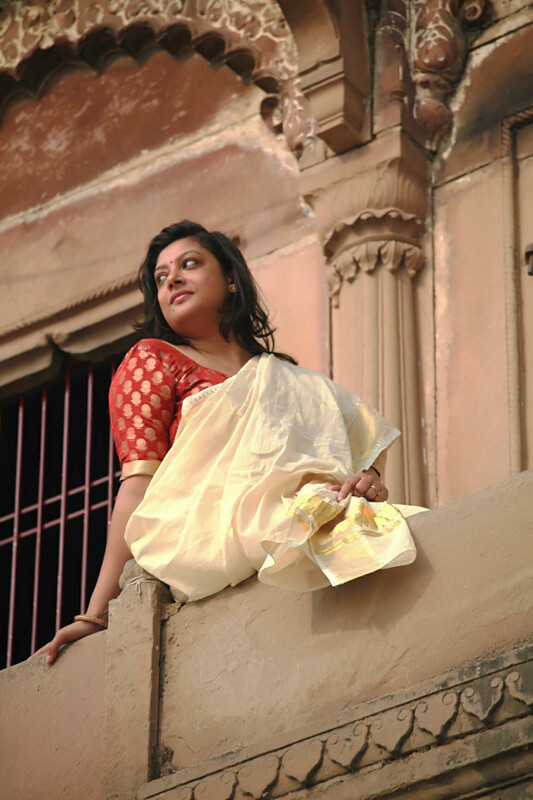 I knew that morning (when you were about to leave for the airport) when you stood at the balcony, alone – savouring the sunrise, that you were living your ‘travelling moment’ .. it was right there, staring back at you in its grapefruit hues! And, I caught you, catching that moment. I caught yours too. Your staring at the dusky sky lying on the boat had caught my eyes. You were transported. One a warm night while changing sides in our beds, many years from now,may be we shall strike the same moment ..together. We need to get together on another trip very soon, and then another..till the ‘same moment’ strikes! Your photographs are as spectacular as always, and your writing spellbinding. You have managed to bring forth the ‘magic’ of the city through your pictures and writing. Really enjoyed reading this one. May you keep travelling and sharing your stories. You should visit again Arnab. Sambrita, brilliant post with spectacular photos too. Waiting for your next post! Enjoyed reading your piece,specially at a time of our life when it is impossible to travel the place your way. Your free spirit of adventure is more impressive than the place written about. My hats off to you. Shall look forward to your next. Thank you Manisha pishi.. am so glad you enjoyed!